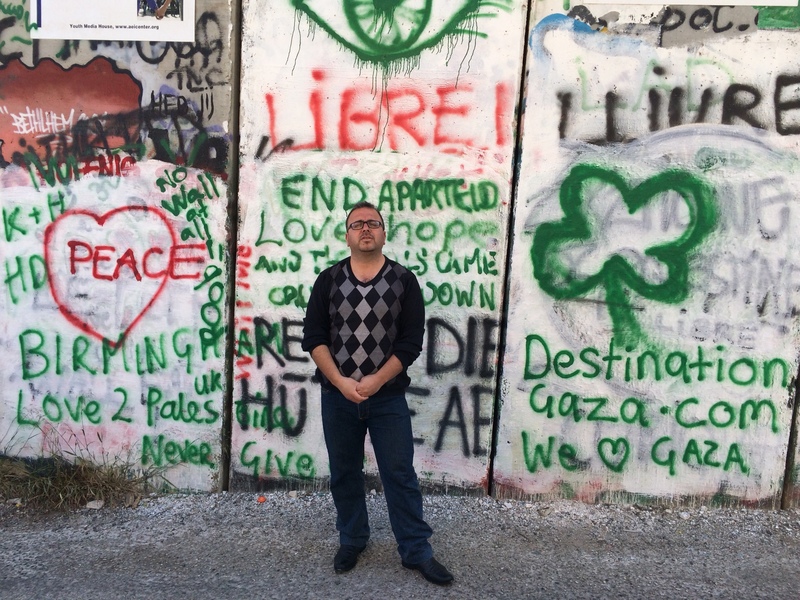 One thing I have to say about the Promised Land (or the Holy Land or Palestine, or whatever you call the area we just explored): story-telling matters there. The stories about the events involving Abraham and his descendants, Christ and his followers, and Mohammed spread so widely and so inspired their audiences that they altered the course of human history. They're still shaping it. Steve and I acquired a bunch of our own (humble) stories in the course of the trip, but my favorite, the one I'll wrap up with, is unfolding in Nazareth. I wasn't even sure we should go there. It has an important church, commemorating the Angel Gabriel's announcement to Mary that the young woman soon would be giving birth to a Very Important Baby (while still remaining virginal.) But I'd read comments from travelers who were unimpressed with the city. On the other hand, I was intrigued by the fact that Nazareth is the most important center for the relative handful of Palestinians who didn't flee their homes because they were afraid of getting massacred (back in 1948) and eventually became Israeli citizens with full rights. About 85,000 Palestinian Israelis today live in Nazareth. Roughly 30% are Christians (Greek Orthodox and other flavors), while the other 70% are Muslims. I also read about an intriguing guesthouse when I was researching where to stay. 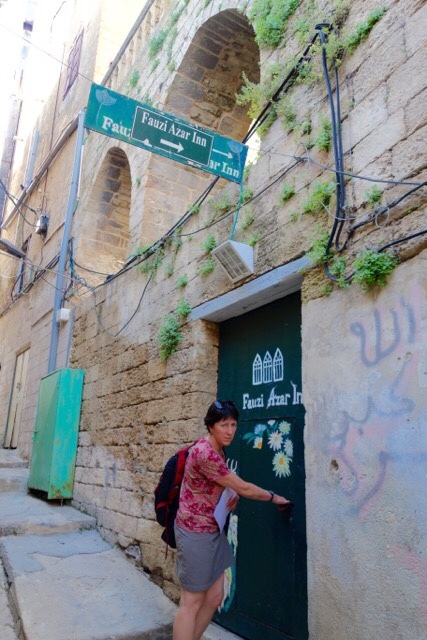 Deep within the Old City, the Fauzi Azar Inn was once an elegant private home. I splurged and booked us one night there. (At $132, including breakfast, it was our most expensive lodging of the trip.) Although it's a bit tricky to find, we reached it without too much stress, and when we opened the low metal door and ducked into the beautiful stone courtyard, we felt we had made the right choice. Our room was large and comfortable too, so the announcement that there would be a free tour of the Old City at 9:30 the next morning seemed almost gratuitous. But we had no better plan for scoping out the place. Steve and I showed up at the appointed time in the lobby, where an attractive woman in her early 40s greeted us. Suraida Shomar Nasser explained that she was one of the great-granddaughters of Fauzi Azar, the Palestinian Christian who built the mansion in 1830. 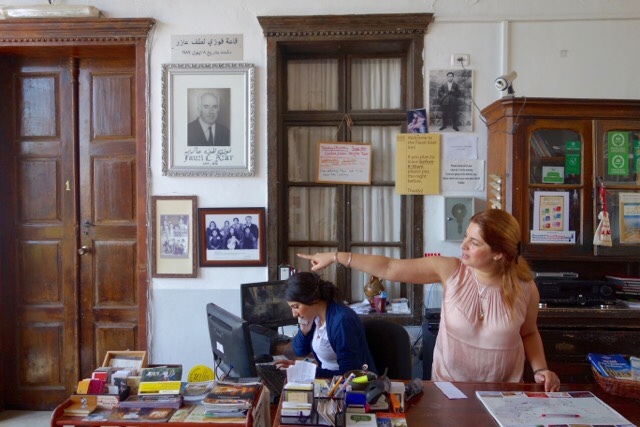 With the creation of Israel in 1948 and the outbreak of the war, most of Suraida's relatives had sought refuge in Syria, but her grandparents remained. Although they gained Israeli citizenship, they lost their extensive agricultural holdings, refusing to take the token compensation offered for the properties, according to Suraida, because they didn't ever want it said that they had given up their land voluntarily. The family's woes were compounded in 1980, when an accidental fire started in the house. Her grandfather was alone that morning, and while he managed to save the manor's three magnificent painted wooden cailings, in battling the blaze he was mortally burned. Her grandmother continued to live in the house until her death in 1989. By then the Old City was in steep decline, trashed by drug dealers, squatters, and transients. The family boarded up the mansion. 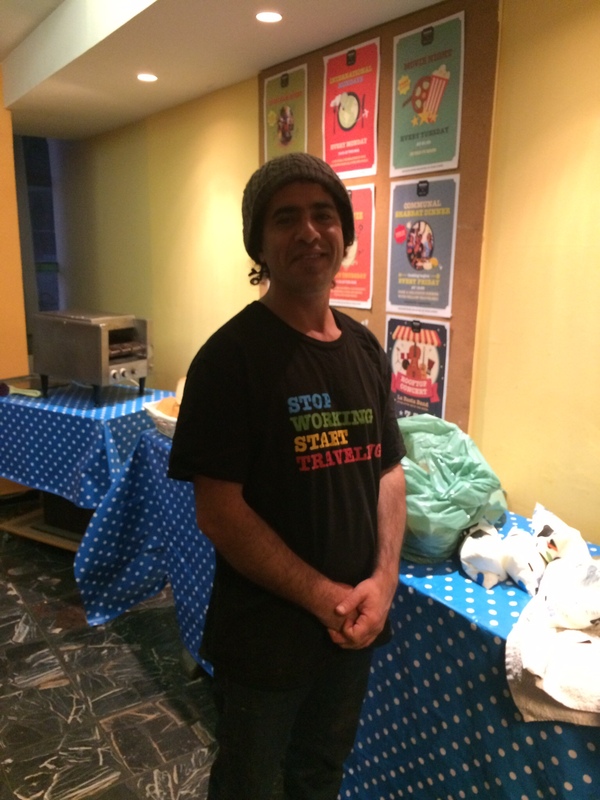 Suraida told us it came as a shock when, one day in 2005, a young Israeli Jew approached her. He was a hiker and backpacker, he said, and while traveling the world, he had noted the growing popularity of guesthouses. He thought Nazareth's Old City could be a great place for one, and he'd heard that the lovely old Azar family home was unoccupied. He wondered if the family would be amenable to forming a partnership to renovate and open it to the public. “Who sent you?” Suraida demanded. The Israeli secret service? The CIA? He denied this, but she pointed out the obvious. He was a Jew. She was a Palestinian. She didn't hate him personally. But she could never, ever trust him. Suraida says she was still so appalled she refused even to visit the Inn when it first opened. (The young Jew had no money; instead he did the work to rehabilitate the building.) Months later, when Suraida finally made a call, the sight of strangers in her family's home felt like an invasion. At the same time, she grudgingly acknowledged the transformation. In spite of herself, she had to admire it. In 2007 she began working as the inn's manager. In the 8 years since, more sections of the house have been restored; today 13 guest rooms are available. The Jewish partner relentlessly pestered the city to begin collecting the trash that made the quarter look like a slum; today the streets are clean. Many storefronts are still shuttered, but more and more businesses have been moving back. Ten other guesthouses have opened within the past four years. 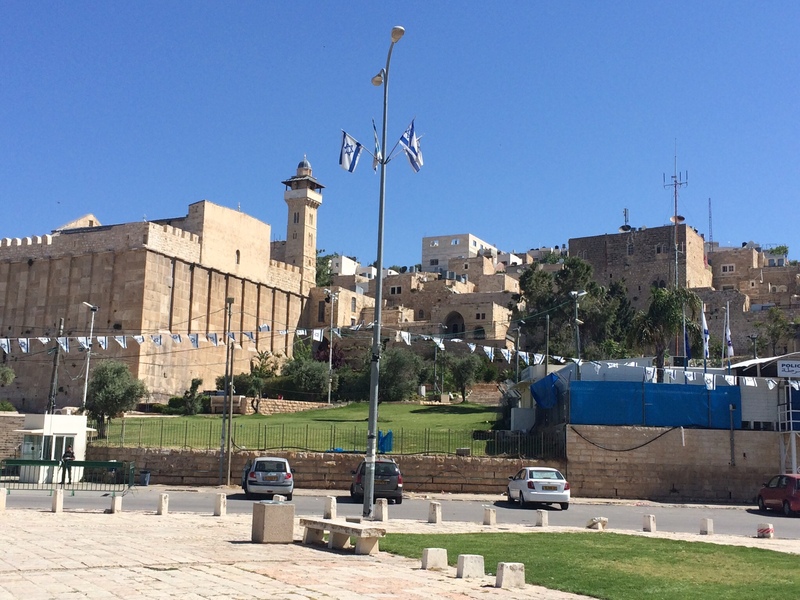 “Today the Old City is flourishing,” Suraida declared. It's still vulnerable. 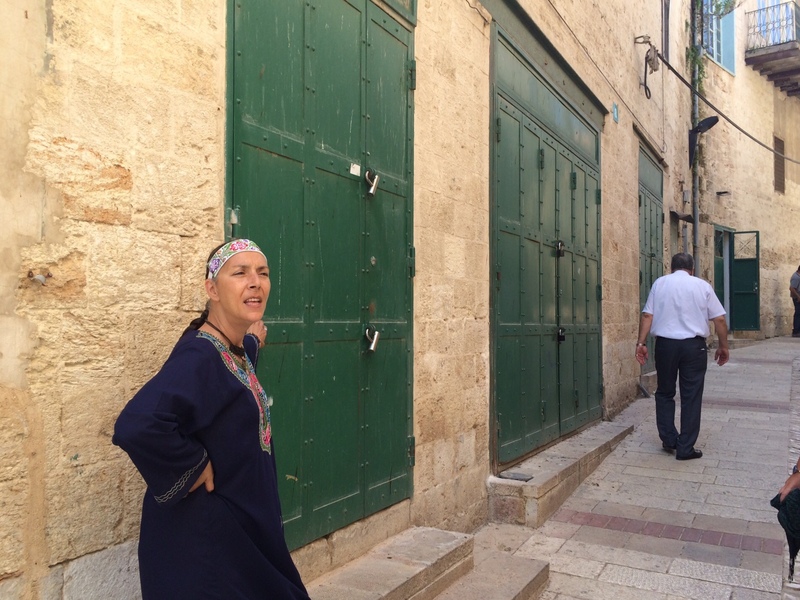 We got some insight into just how fragile the renaissance is from Linda Hallel, the volunteer who leads the inn's daily free tour (after Suraida recounts the history). Born in Michigan, Hallel arrived in the Galillee six years ago and worked for some months as a guide on the Jesus Trail. But she'd fallen in love with the Inn and its principals and was willing to develop a non-political tour that would steer clear of conventional sights. Instead she wanted to give the inn's guests a peek into the inner life of the community. It's been a big success, but during the Gaza war last summer, tourism in Nazareth plunged so sharply almost all the staff was laid off. In addition to keeping up the tour-leading, Linda had worked for free as the Inn's receptionist seven days a week for months. Now tourists finally were returning. The upturn in the Old City's fortunes seemed evident as Hallel led us through the stone-lined passages for more than 2 hours. 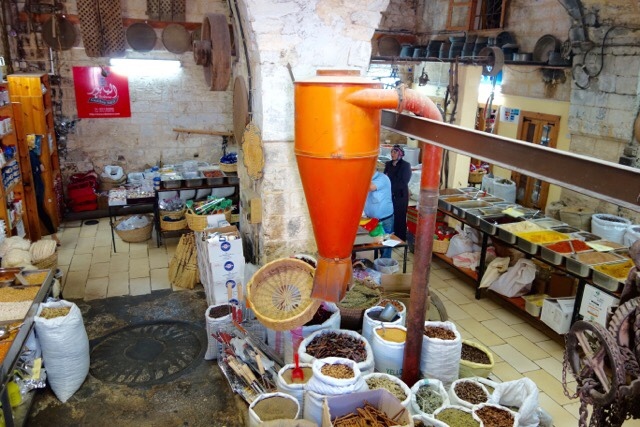 We spent time in the 100-plus-year-old spice shop that's reputed to make the best zaa'atar (a Middle Eastern spice mix) in the world. 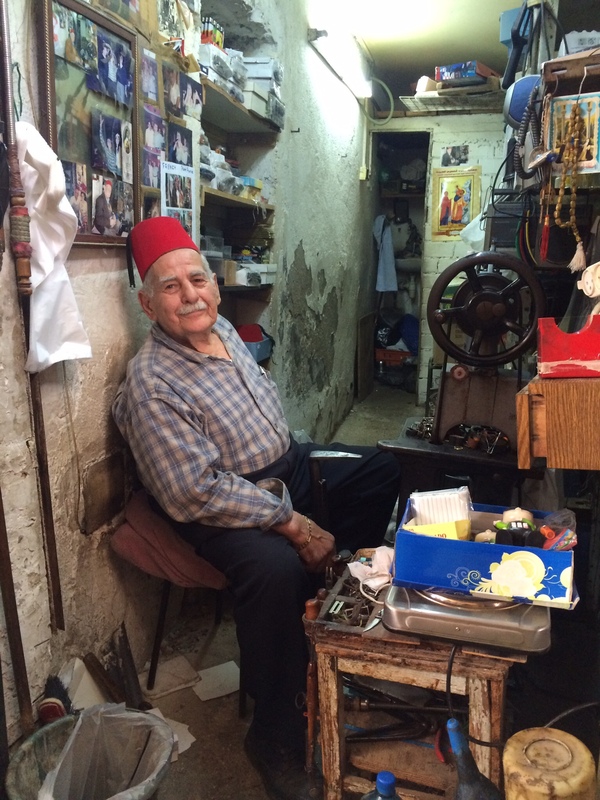 The fabulous El Babour Spice Shop operates out of a 250-year-old building. We toured the cemetery and sipped tea in a cozy storefront. We visited a carpenter's shop. 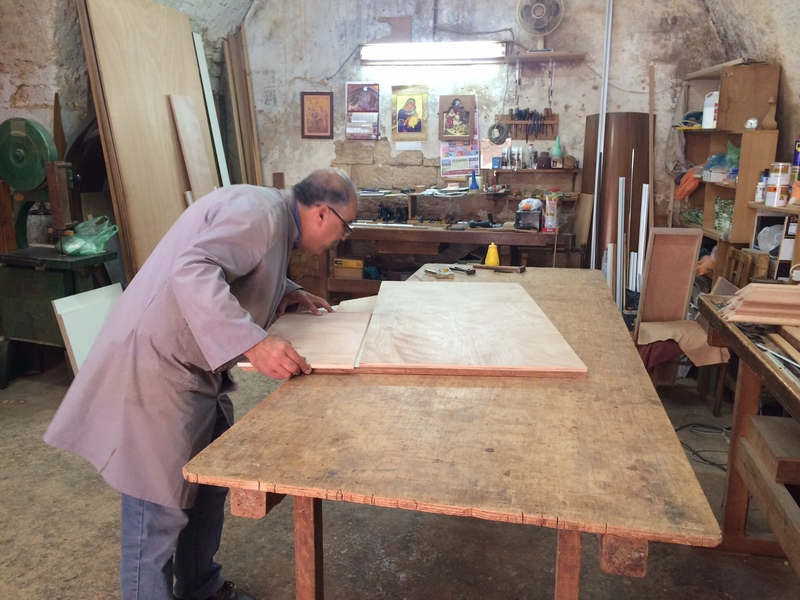 Carpenters in Nazareth work the old-fashioned way. Down the street from it, we sampled excellent falafel. At the end, Linda suggested that if we wanted to donate any money, she wouldn't take it herself but would pass it on to the local orphanage where she also volunteers. Throughout our stay in Israel, Steve and I spent a lot of time discussing the country's future. There's so much to be pessimistic about — the entrenched positions, the poisonous distrust, the burgeoning barriers. What we saw in Nazareth gave me a tiny sliver of hope. It reminded me that, once in a while, extraordinary people can develop visions of new ways to act. If their ideas became contagious, if they circulate far enough, things change. 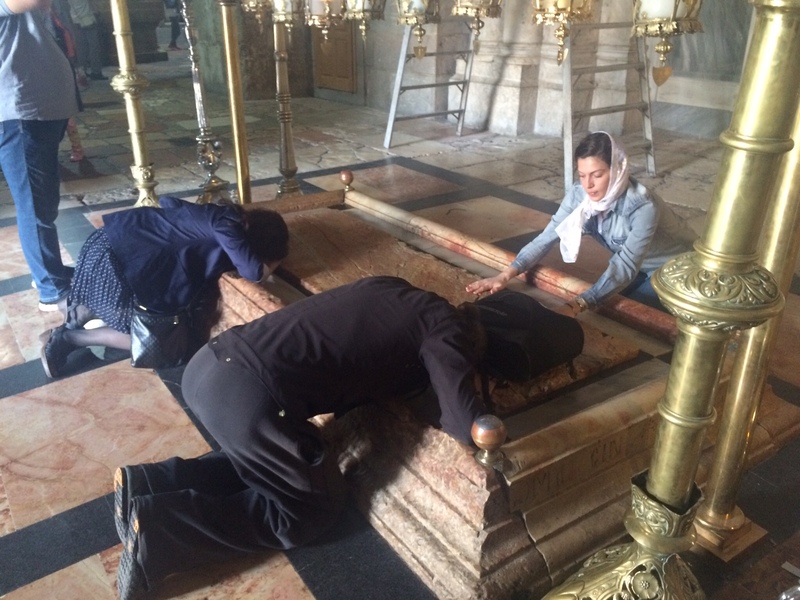 During our two final days in Israel, I stuck my fingers into the hole that held the cross on which Christ was nailed. (In order to touch it, you have to kneel before the little altar (see below) and reach in. I rubbed my open palms over the stone slab on which his body was prepared for interment. 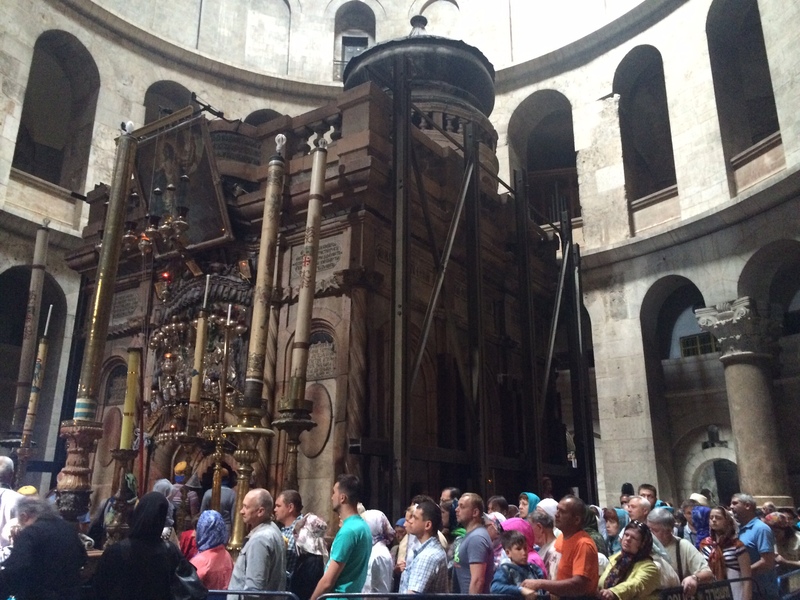 Some pilgrims merely pray at the stone on which Jesus's dead body was prepared. Others rub things on it to be sanctified. We tried to go into the little chapel surrounding the cave into which his corpse was placed, and from which he was resurrected, but the line was so fiendishly long we reluctantly bailed. The marble chapel containing Jesus's tomb. 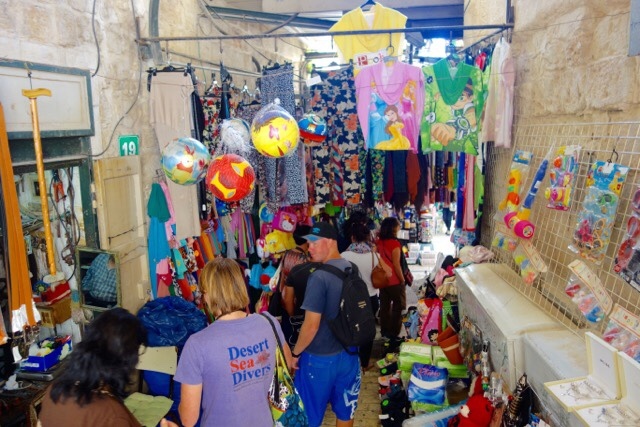 Instead we walked around to the back of the structure, a quiet place where I was astonished to find a tiny cave-like shop selling candles and a handful of other religious items (this less than 10 feet from where Jesus rose from the dead!) 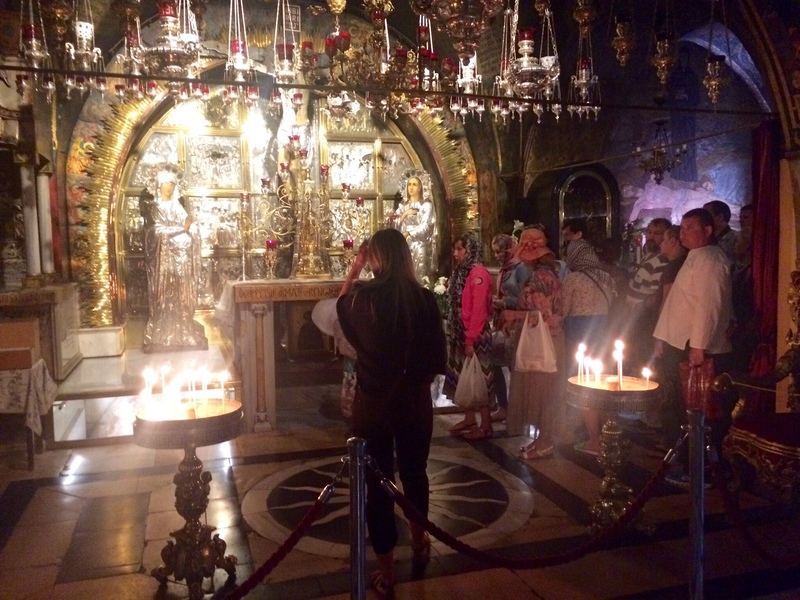 All these things are in the Church of the Holy Sepulcher, an enormous stone complex that encases the whole hillside known as Golgotha (or Calvary) where the foundational events of Christianity played out. We found it disconcerting to learn that what we always thought of as outdoors (that infamous hill) is now deep inside a structure at least as massive as the Cathedral of Notre Dame. After leaving the church, we tried to walk along the Via Dolorosa, the “way of the cross” and follow the 10 famous “stations” that aren’t inside the church. But we got a little lost and wound up instead in the Western Wall plaza, one of the ultimate pilgrimage sites for religious Jews. They come to this particular section of the wall that once surrounded the second great Jewish temple (the one built by Herod and from which Jesus chased out the money-lenders) because it’s the closest point to the so-called “foundation stone” at which they can pray. (The foundation stone was the rock where God ordered Abraham to sacrifice his son Isaac, thus, in effect, founding the Jewish religion.) They can’t pray at the foundation stone itself because it’s inside the Dome of the Rock, which along with the whole area that the temple once filled has been controlled by Muslims (or Romans or Crusaders) for close to 2000 years. 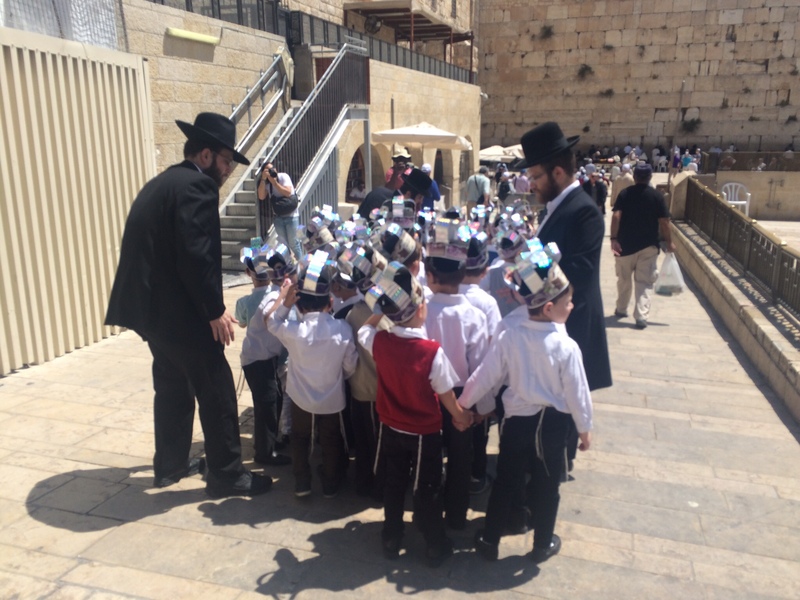 These Orthodox guys were escorting an adorable group of little guys to visit the men's side of the Western Wall. On the ladies side, some sit and pray, some pray with their heads pressed to the stone, and many stick little paper prayers into the cracks. 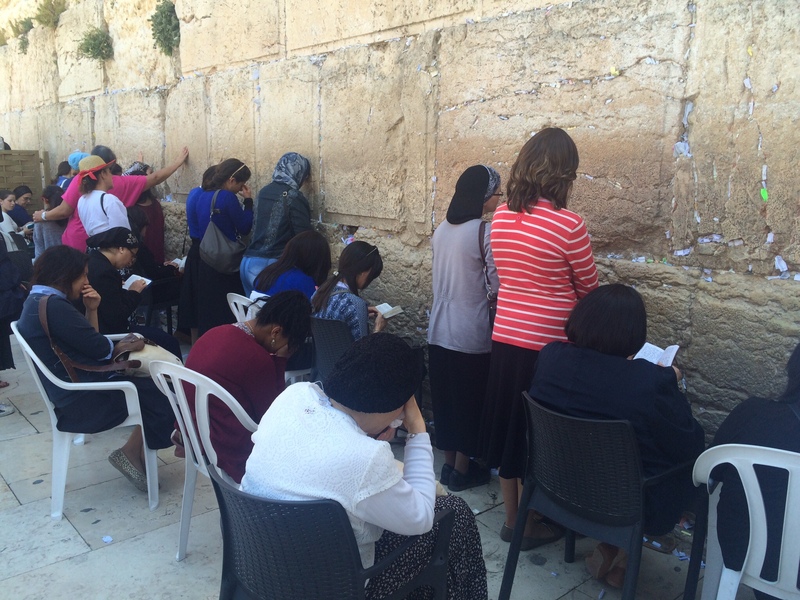 Both Jews and tourists can get into the former temple walls, but a) they can’t do any conspicuous praying and b) the visiting hours for non-Muslims are limited. Steve and I breezed in about 10:55 Tuesday morning, but 5 minutes later, the guards told us we had to leave, as the lunch-hour Faithful-Only period was starting. We tried returning at 1:30, when we knew that infidels would be allowed in for another hour-long period, but the line was so long it looked as if it might take an hour just to get through the security checkpoint. So we returned early the next morning (Wednesday) and strolled the enormous grounds (the size of 33 football fields), happy to have made the effort. Only Muslims are currently allowed inside the gold-topped, gorgeously tiled Dome of the Rock (from which Mohammed made his ascent to Heaven.) But just taking in its beauty was a sort of religious experience for me. How much of a religious experience the Holy Sepulcher or the Western Wall or the Dome of the Rock is for anyone of course depends on what you believe and how strongly you believe the precise details (eg, did Mohammed really fly on a magical horse to this exact spot and is that divot in the rock really his footprint? Was Jesus really entombed and resurrected just a few yards away from where he was crucified?) However, Steve and I had three other Jerusalem experiences that, if not miraculous, would probably impress pretty much anyone. — We went underground. 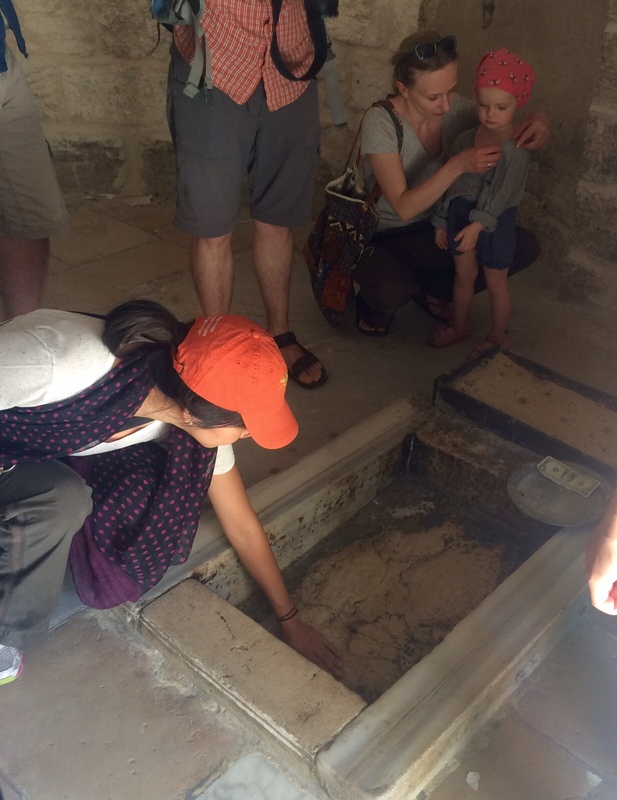 We took the tour of the tunnels that archeologists have been excavating near the Temple Mount since 1967. Since Jerusalem has been built up in so many layers over the past 2000-plus years, this work has greatly illuminated the city’s complex past. And it once again makes you shake your head in awe at what a builder Herod was. The stones in the temple wall are some of the biggest ever used anywhere in human history. Here’s one, for example, that’s 45 feet long and is estimated to have weighed more than 625 tons. The photos doesn't do justice to the size of this whopper. — We strolled through the neighborhood of Me’a She’arim, just a few blocks from our hostel. It’s long been one of the best-known enclaves for ultra-orthodox Jews. The men wear some of the stranger outfits remaining on our planet. Their most religious women shave their heads (for the sake of modesty) and then cover their bald pates with hats or wigs and berets. Just four years ago, the community wanted to designate separate sides of each street for men and women (apparently the Israeli supreme court nixed that.) I was too nervous to take many photographs, as the residents have been known to throw stones at gawkers who are dressed too immodestly or otherwise violate community norms. But no one so much as scolded, let alone stoned, us. 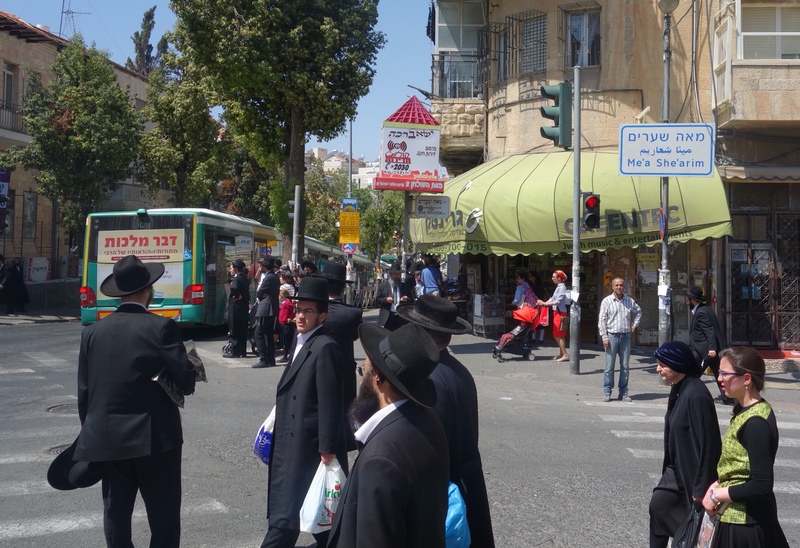 Strolling in the ultra-orthodox 'hood. 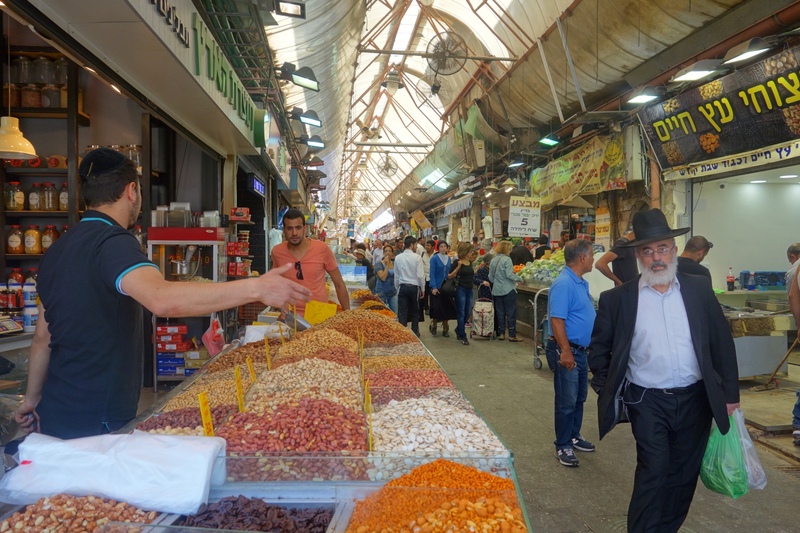 — We ate spectacularly well.The Abraham Hostel also is just around the corner from Mahane Yehuda, the vast central market area crammed with nuts, dates, olives, candies, bread, fish, meat, halvah, pastries, coffee, tea, spices, and a vast array of beautiful fruits and vegetables. 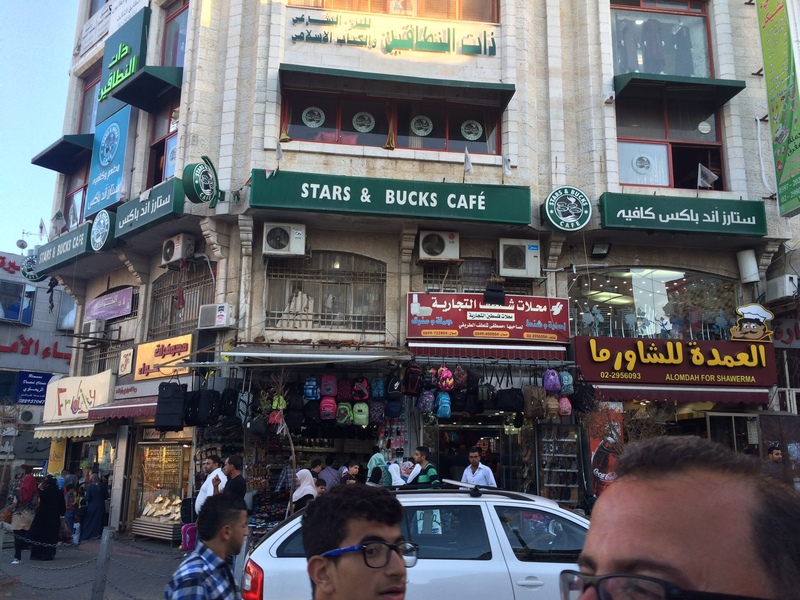 Mahane Yehuda ranks with the greatest markets on earth, IMHO. In recent years, the vitality of the market has also apparently sparked a culinary renaissance in Jerusalem. We ate five meals in and around it that ranged from excellent to electrifying. HaSchena was so wonderful we went back two nights in a row, during the first of which I embarrassed Steve by moaning so loudly over how good every single dish was. It struck me that humans have developed ways to capture and share so many aspects of life — we reproduce sights with photos and videos. We record sounds with tape or digital recorders or our iPhones. But there’s no way to document and share physical tastes in a similar fashion. Some of the food we ate on this trip was so good I yearned to preserve it, both for myself and to pass along to others. As it is, you’ll just have to take it from me that it was fantastic. On faith. After all the political intensity of Saturday and Sunday’s West Bank tours, our outing Monday was a welcome change. It took us to three bucolic destinations within a two-hour drive from Jerusalem, all top stops on the Israeli tourist circuit. A sweet, gentle fellow named Alon drove the mini-bus that transported us. He introduced himself by mentioning that he had grown up in Israel as a “black-hat Orthodox” (Jew) but had parted ways with that life four years ago. Although he didn’t accompany us into any of the sights, he offered a lot of commentary and explanation as he drove. He also played a number of songs over the bus’s sound system, pieces he had specially selected for various moments; they made me feel inordinately happy, rolling along. 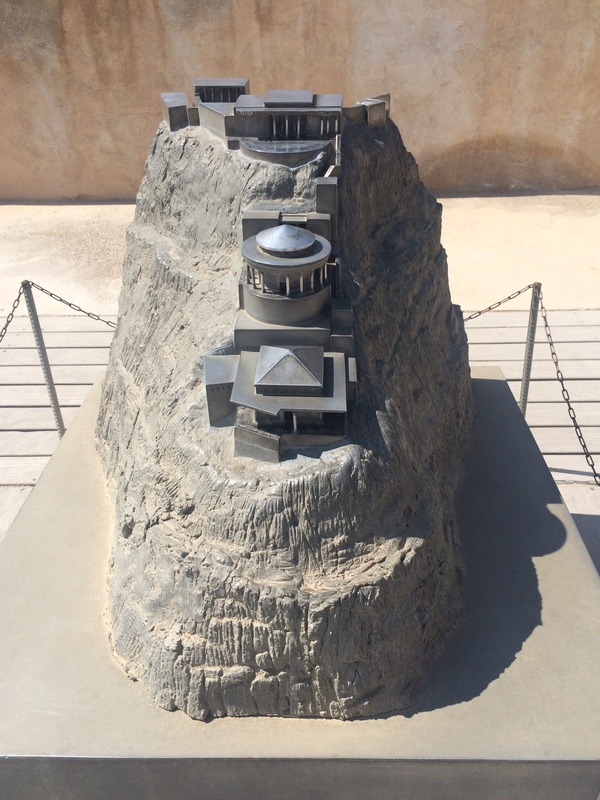 Our first stop was Masada, the mountaintop palace fortress conjured up by that dazzling builder (and psychopath) Herod. It’s almost impossible to imagine how his workers transported all the construction materials 1400 feet almost straight up the forbidding bluff top. Only ruins of what they built 2000 years ago remain, of course, but there are enough of them (coupled with educational explanations) so you can understand how mind-boggling the completed 18-acre complex of palaces, water works, and storehouses must have been. Also astounding is the fact that more than 900 of the last Jewish rebels against the Romans’ Evil Empire were able to hold out up there for years, consuming the supplies Herod had socked away. Romans soldiers spent two years building an assault ramp up to decimate the Jewish hold-outs, but rather than be captured, the rebels all killed themselves. 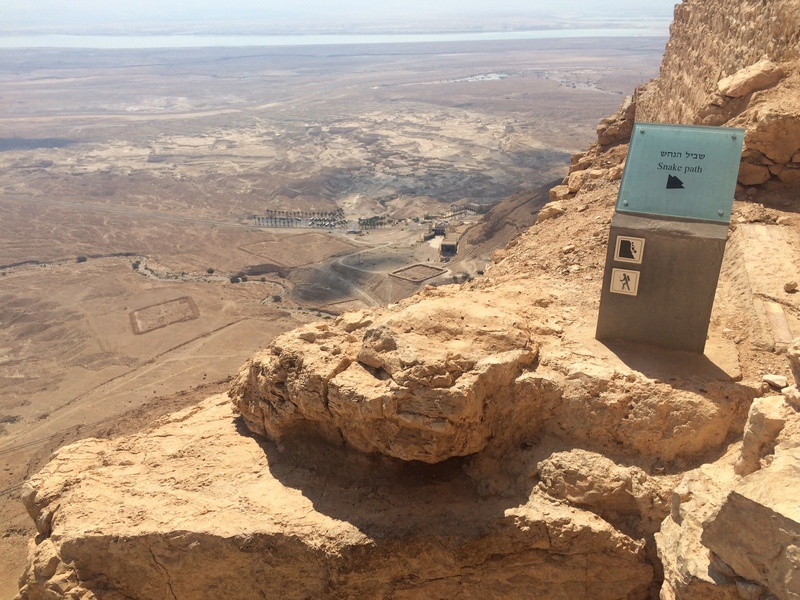 Like everyone else in our group, Steve and I opted to take the cable-car up, but then we hiked the Snake Path to the bottom, enjoying the panoramic views of the harsh desert landscape and nearby Dead Sea. 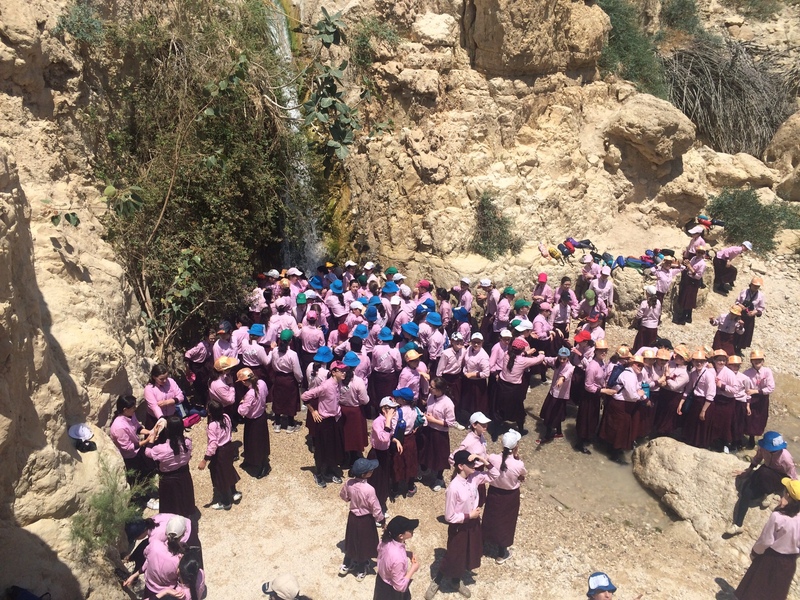 Next stop was the oasis and nature reserve of Ein Gedi. It reminded us a lot of Palm Canyon in our own Anza Borrego Desert state park minus the hordes of shrieking orthodox Jewish girls, frolicking fully clad (athletic shoes and all) in one of the waterfalls. It may be dead, but it's so beautiful. That was entertaining, but the brightest highlight of the day for me was our 90-minute stop at the Dead Sea. Steve and I had seen it once before, back in 2008, while traveling in Jordan.That day had been so snowy there was no way I could stick more than a toe in the frigid water. Monday, in contrast, was a balmy, cloud-free day. The resort to which Alon took us was an complicated facility, including gift shops, restaurants, a swimming pool, changing rooms, and extensive picnicking and outdoor lounging areas. 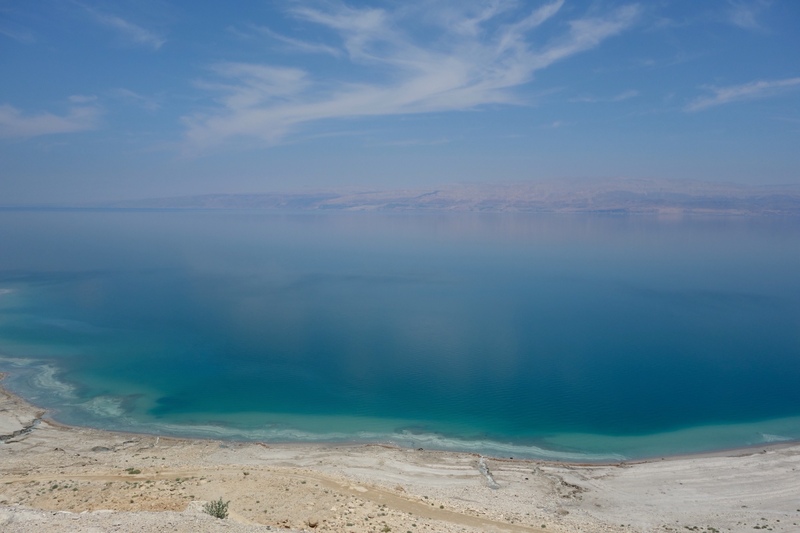 Alon had talked several times throughout the day about how much the Dead Sea has shrunk over the past few decades, as Israelis and Jordanians both have diverted the water that feeds it to the Jordan River Valley agricultural enterprises and settlements. Our destination near the northwest corner of the Sea (really a lake) was around 75 feet higher above the shoreline than it once had been, and we’d seen plenty of sinkholes throughout the day, another phenomenon related to the sea’s not so gradual disappearance. It was depressing. And yet, everyone was in such high spirits. I changed into my bathing suit and descended to the waterfront. Alon had told us the famous mud that once lined much of the Sea’s shoreline also was disappearing, but he said it still could be found in this place and was renowned for its skin-rejuvenational qualities. Gingerly, I crept into the ooze and within a step or two sank so abruptly I almost toppled over with a splash. But I recovered and scooped up handfuls of the thick black goo, smearing it all over my skin, just as all the bathers in my vicinity were doing. The classic floating in the Dead Sea pose. Steve took a few pictures, then joined me, and we both eased into floating positions. Even Steve’s leaden feet popped right up (normally they sink.) The Sea is 10 times saltier than the ocean — around 30 percent salt (which makes it so salty nothing can live in it, hence its name). When droplets invaded my eyes, they burned. In my mouth, they tasted beyond salty, as if they’d gone off that scale and moved into the bitter zone. The liquid in which we floated so easily wasn’t exactly bathwater warm, but somehow I didn’t feel chilly. It also had a greasy quality. 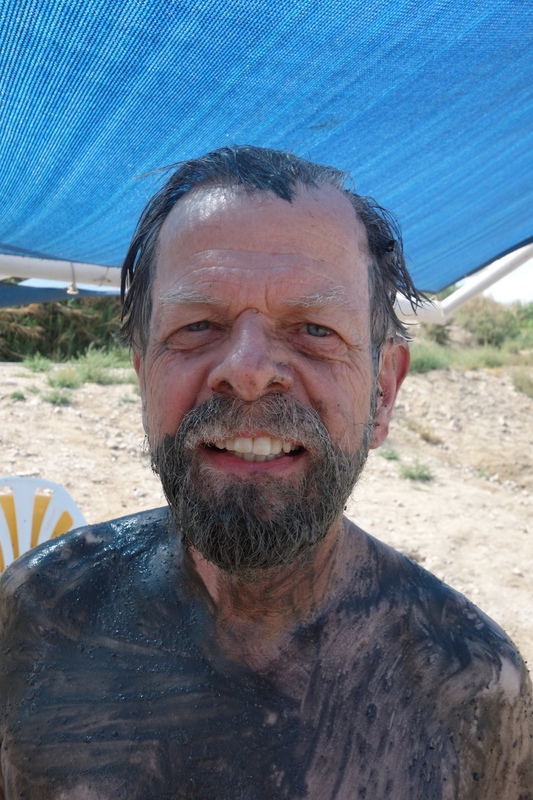 Not Grecian Formula for men -- but Dead Sea mud. Perhaps most remarkable was the effect floating in it seemed to have on everyone, People were laughing and playing, gleeful at the ways their bodies were reacting to this weird stew. Entering the resort and changing in the dressing rooms, I’d been aware of the mix here — Palestinians and Israeli Jews and all manner of foreign tourists: Russians, Italians, Chinese, us. But in the Dead and Disappearing Sea, the tribal differences receded. Someone joked about swimming to Jordan, which looked as if it would be easy, both because Jordan was just on the other side of the lake and because not a single soldier was in sight. The water, unnatural and corrosive as it might be, seemed to be scrubbing away the rivalries and suspicion, if just for this brief dip, and It made me feel even more buoyant. 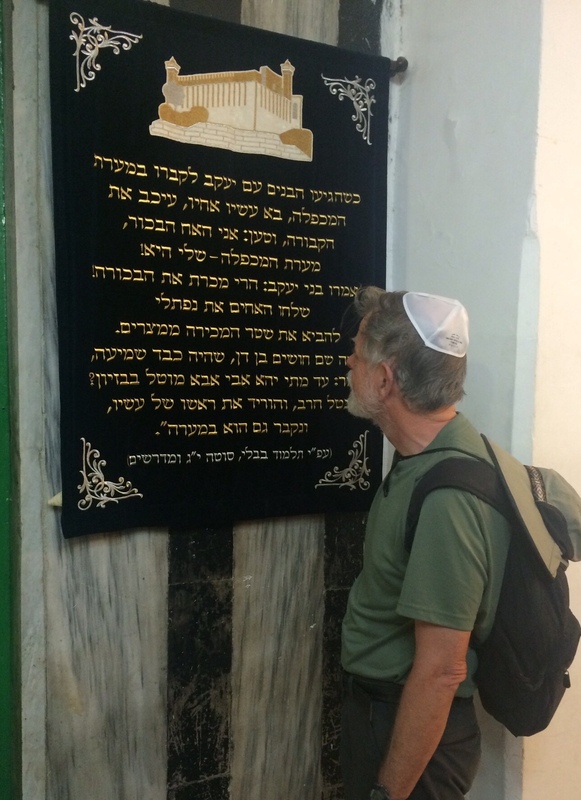 Here's Steve channeling his inner Israelite on our visit to the Tomb of the Patriarchs in Hebron. 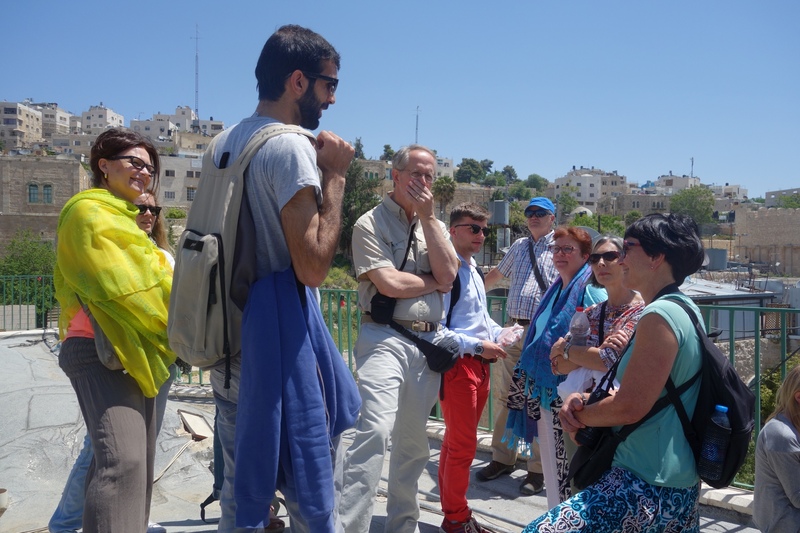 Steve and I took the Abraham Hostel's “Best of the West Bank” tour on Saturday (when everything in Jerusalem is shut down because of the Sabbath), and the “Hebron Dual Narratives” tour Sunday. Both were long and in some ways grueling days (almost 12 hours each) that took us deep into the ideological heart of the Israeli-Palestinian conflict. We found them spell-binding, for the most part, and learned a lot about how each side sees things. In fact, I came away feeling that I'm finally beginning to understand the situation. But the reason it has taken me so to do so is because it's way too complicated to cover in a blog post. Instead I'll present Six Things I Learned about the Jews and Arabs in This Country (and the big chunks of land adjoining this country that aren't really countries but where millions of Arabs live and Jews are increasingly moving to). #1 It's grossly inaccurate to generalize about how all Jews or all the Arabs do anything here. Opinion among the Jews here ranges from ultra-Orthodox folks who are deeply anti-Zionist to left-wing peaceniks to the militaristic supporters of Bibi Netanyahu to many other shades of thought. Among the Arabs you can find pacifists, suicide bombers, and everything in between. But everyone here generalizes about the Jews and Arabs. So damn it, I will too. #2 You can feel quite safe in both Israel and the Palestinian territories. A typical Bethlehem street scene. or hanging out in a shisha cafe in Ramallah (a surprisingly lively, cosmopolitan center). Okay. They lie everywhere. And I can't say who here fibs more — Israeli Jews or Palestinians. But we've heard a couple of real whoppers in the last few days. I'm not talking about the guys in the souq who called out that they would give me a special price. Instead I'm thinking of the (licensed and highly experienced) Israeli (Jewish) guide, named Amitai, who toured us through the Old City and the Mt. 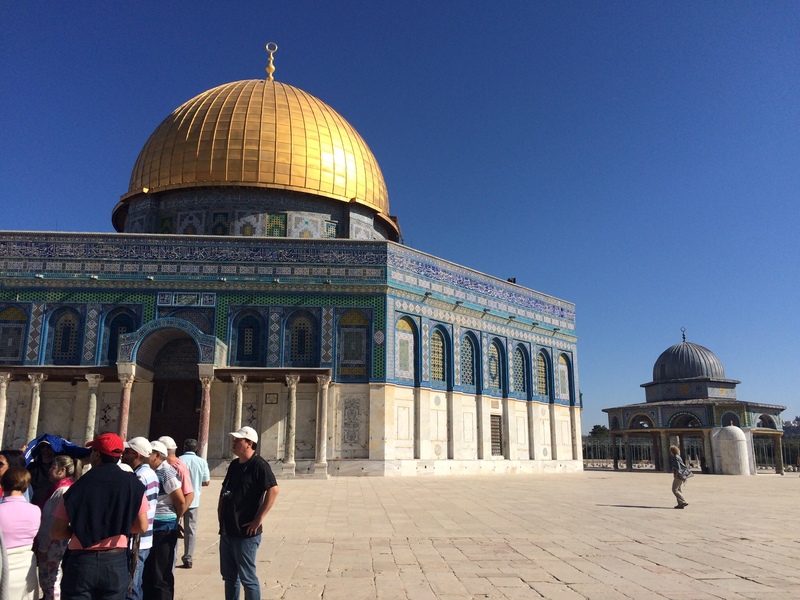 of Olives Friday and told us that Muslims don't believe Mohammed ascended to heaven from the spectacular golden Dome of the Rock but rather from the nearby Al-Aqsa Mosque. (From everything I've heard and read, both from our guidebooks, the Internet, and a Muslim guide, this is patently untrue.) Amitai also told us that the way to identify when you were in the Muslim Quarter of the Old City (as opposed to the Jewish, Christian, and Armenian Quarters) was that the Muslim Quarter was the dirty one. Then there was the Jewish settler in Hebron who declared to our group that Hebron was a really peaceful place where life was very relaxed. He was packing a pistol as he said this. A little while later, we watched a convoy of Israeli armored vehicles take off rolling into town, lights flashing. When we hear statements like that here, Steve and I tend to suspect there's some political agenda, though we often don't have a clue what it is. #4 Many Israelis and Palestinians are very likable. That guide Amitai also talked to our group for several minutes about the rudeness and obnoxiousness of his fellow Jerusalemites. He said we shouldn't take this personally; instead he advised us to ignore it. But in fact, Steve and I have not found it to be true. Many times we've paused on the street to consult our map or guidebooks and someone has approached us, asking if we need help. I was completely smitten by the intense young waiter at the stunningly good restaurant where we ate last night. We've found many of the Israelis we've met to be sweet or charming, if often edgy. As for the Palestinians, several of them won our hearts. One was Tamer, the (also) edgy but hilarious guy who led us on Best of the West Bank excursion Saturday. “Welcome to the terrorist tour,” was his first statement to the busload. “You are now officially kidnapped by me.” Throughout the long, tiring day, he never harrangued us, never lectured, but seemed to devote a lot of thought to finding ways for us take in the scenes of everyday life. In Hebron our guide was an endearing, rail-thin 28-year-old graphic artist named Motasem who calmly and quietly recounted some of the vicious events that have unfolded over the last dozen and a half years in Hebron (where the Israeli government has installed more than 100 security posts and checkpoints in the one-square-kilometer Old Town, closed the main street and barred the doors of more than 500 Arab businesses, and employed more than a 1000 (or was it 2000?) soldiers to guard the 400 or so settlers living in the central city. Our Palestinian guide, Motasem, talking to the group. 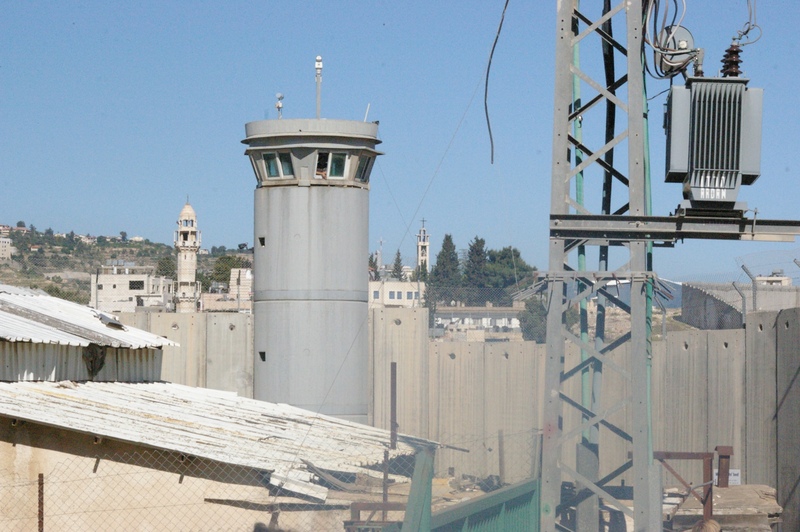 The Israelis have welded shut the storefronts on this close street, and the Palestinian occupants live behind bars to protect them from rocks thrown by the settlers. 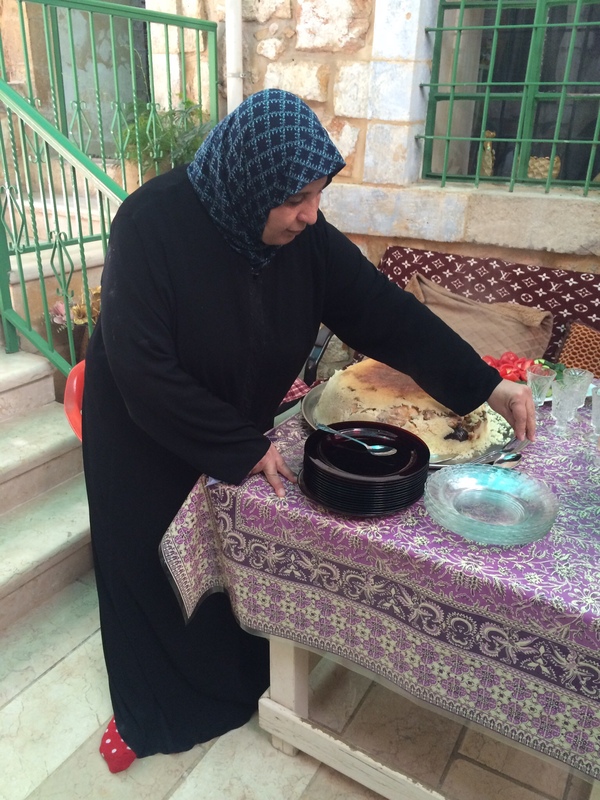 A welcome break from the tension was our lunch of chicken and rice in the calm courtyard of a Palestinian home. #5 Many Israeli Jews think they deserve to live in all of former Palestine and that the Arabs here can never be trusted. 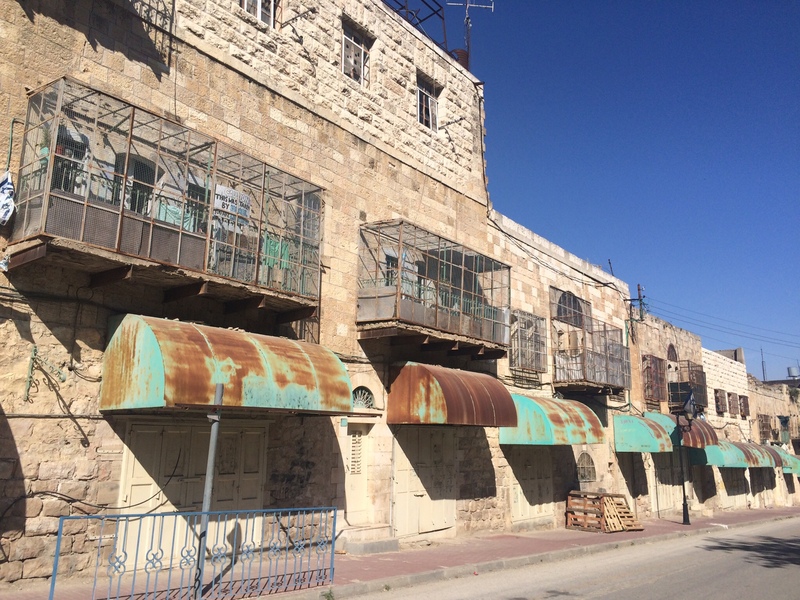 The really terrific thing about the Hebron Dual Narratives tour was that it exposed us to both perspectives in Hebron — that of the Palestinian natives and the Jewish settlers. Our main guide, Eliahu, was a Hassidic Jew born in Hawaii who immigrated to Isreal a couple of decades ago. He forcefully articulated several key points throughout the day. 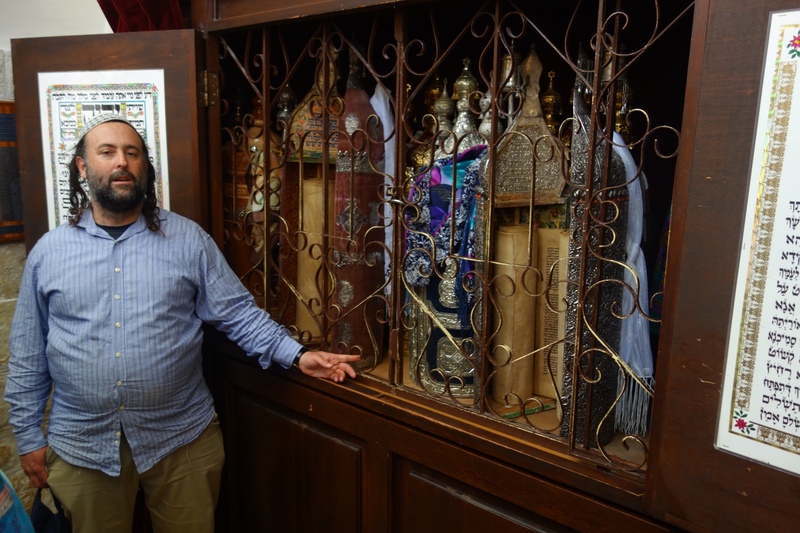 Our Jewish guide Eliahu shows off 300-year-old Torah scrolls. 6) History casts particularly long shadows in this part of the world. In the gloom of those shadows lie explanations for many of the seething antipathies. Understanding the history is tough, but I've made an effort on this trip. I've tried to summarize it in the Appendix to this post. But it is ridiculously complicated, isn't it? Time for me to quit trying to explain it. The Jews weren't the first folks to live in what today is Israel and the West Bank. But they were here a very long time ago. The Romans essentially kicked them out in 70 AD/CE, and many other people took their place, including (starting in the 600s) Muslim Arabs. The Crusaders kicked them out for a while but then other Muslims conquerors struck back, with Mamluks and Ottomans (Turks) ruling until the British took over in 1917. The Brits used the old name Palestine to refer to the place they ruled. By 1947 the Brits were sick of ruling, and the 1.3 million Arabs and 600,000 or so Jews who lived here then were sick of them. After the horrors of the Holocaust, Jews all over Europe were also looking for a sanctuary, and they finally convinced the UN to come up with a plan for making Palestine a Jewish homeland (with small sections reserved for the Palestinians who had once lived pretty much everywhere here.) The day the Brits actually left, David Ben Gurion declared that the Jews were turning “their” part into the state of Israel. Several Arab countries contested this but lost the so-called 1948 War (except for Jordan, which took the whole big West Bank chunk that was supposed to go to the Palestinian Muslims.) In the 1967 (so-called 6-Day) War, the Israelis took back the West Bank and a lot more. But they've been unwilling to give the Palestinians sovereignty over their parts (the West Bank and Gaza), nor are they willing to make Arabs in the occupied territories Israeli citizens. Instead, Israeli Jews are moving in large numbers (close to half a million currently) into government subsidized West Bank settlements, where they live in walled compounds protected by machine-gun-toting Israeli army soliders. Steve and I haven't been big hostel patrons. The idea of sharing a dorm room with 4 or 6 or more young revelers has never appealed to us. But in recent years we've become aware that many hostels offer private rooms, many with private bathrooms. I've also noticed they're showing up more often in the search engines I use such as TripAdvisor and booking.com and in guidebooks like Lonely Planet. 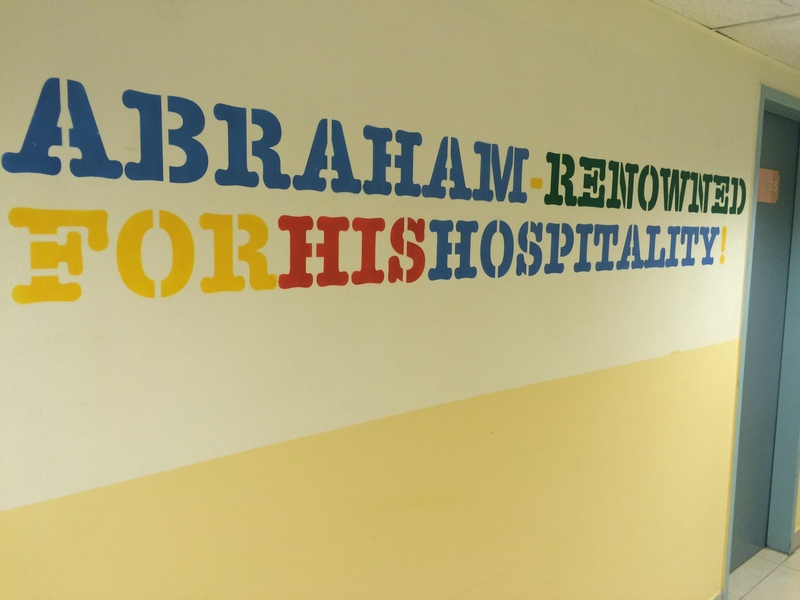 One such source made me aware of the Abraham Hostel in Jerusalem. The enthusiastic reviews of it, coupled with the high cost of hotel rooms in Israel, prompted me to book a private room for 6 nights there. Not much to look at, but it's working for us. When we checked in Thursday night, exhausted from our long day and high-adrenaline arrival, my first impression of our third-floor room was that it was plain, but serviceable. Since then, my admiration for the place has been growing daily. The location is excellent. A 20-minute stroll down a lively pedestrian street takes us to the Old City. Our room is not only clean and quiet, but the lighting is excellent, and the simple furnishings and room layout have made it easy for us to get organized (two things I can't say about every hotel.) Breakfast is included in an Abraham stay, and again, it's not a vast and varied spread, but what's available is all good: excellent granola and cornflakes, hard-boiled eggs, decent cheese and yogurt, and a wondrously efficient Swiss espresso machine that makes excellent cappucinos. This you consume in the huge common room — part refectory, part lounge, part bar (where flights of local beers and daily mixed drink specials fuel the lively interaction. One of the most likable things (to us, at least) is the range of ages in evidence — traveling 20-somethings mingling with young families and a handful of retirees ranging from early to almost geriatric. Last Friday night maybe 100 of us guests (many Jewish but some not) shared a traditional communal shabbat dinner that was delicious. 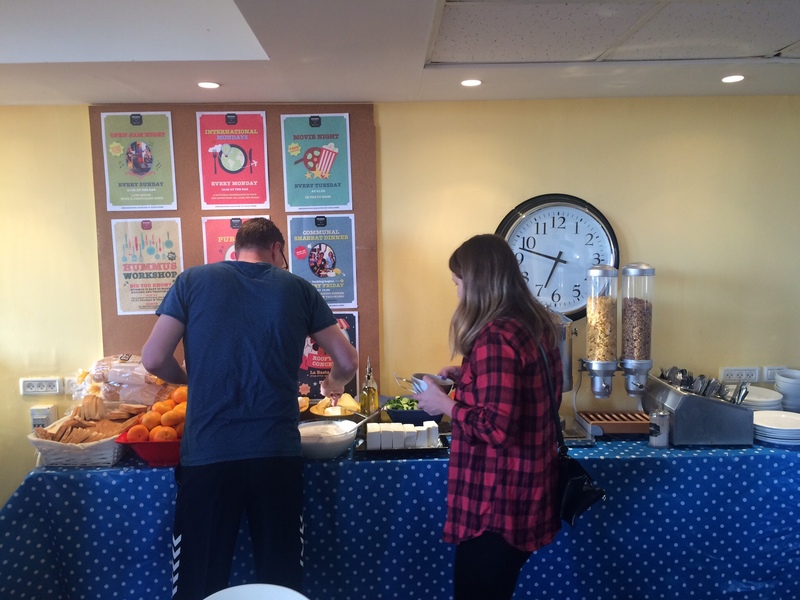 When I got up early Sunday morning to blog, I went down to the common room. It was empty, except for a guy who was setting up the breakfast. Although the Swiss Jura was still warming up, he invited me to help myself to hot water and instant coffee. We chatted a bit, and I learned he was the visionary behind the Abraham. He had opened it four years ago, and it was such a huge success, he would be opening a second one in Tel Aviv in about two months. I told him that the thing I most admired, besides the jolly, homey atmosphere, was how efficient the hostel is at dispensing touristic information. Large maps given away at the front desk answer just about every question I can imagine: where are nearby restaurants? pharmacies? bars? 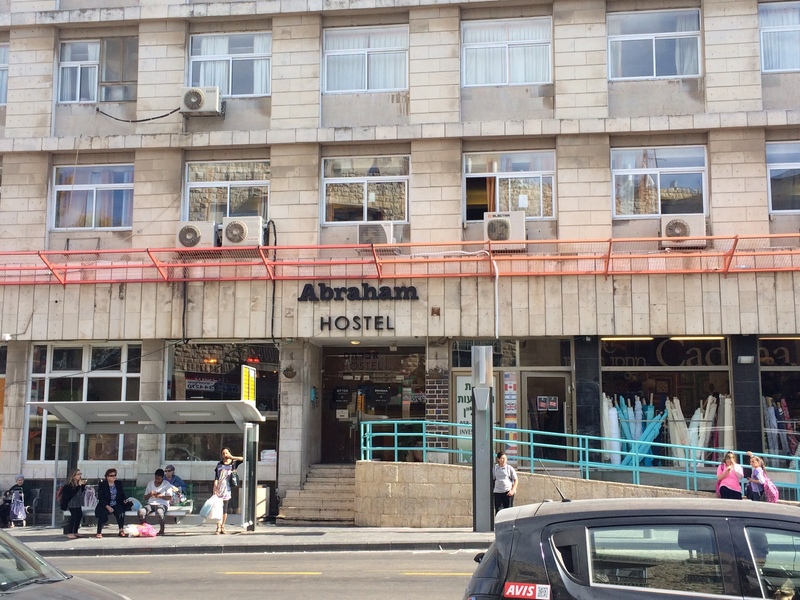 How can you get from the Abraham to Ben Gurion Airport? More extraordinary is the Abraham Travel Center in the lobby, which offers an assortment of tours that sounded so interesting I booked several online in advance. 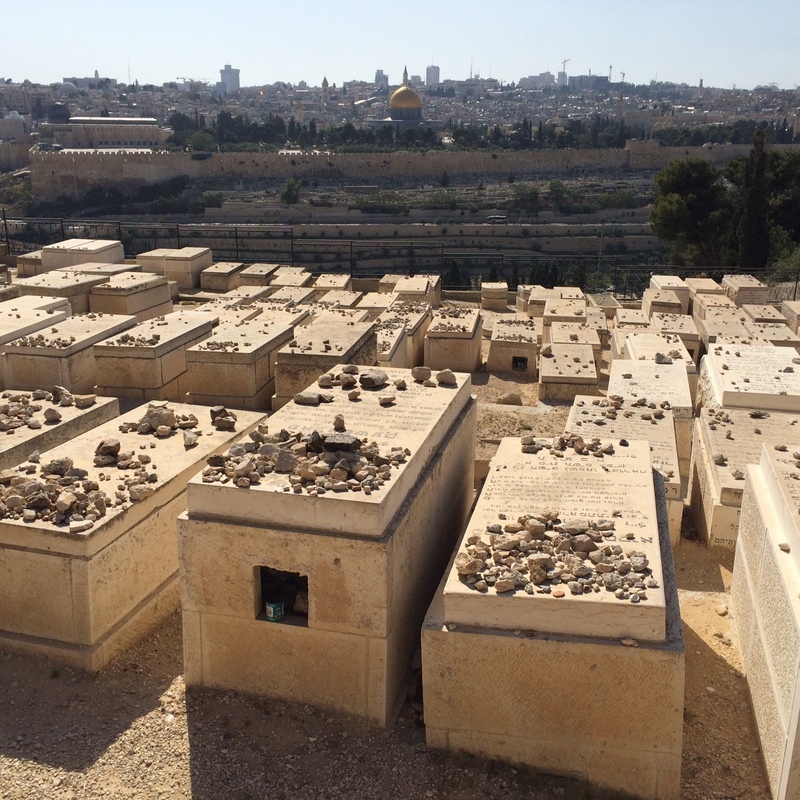 Some of the Jewish graves facing the temple (and the golden Dome of the Rock.) The stones on the graves are a sign of veneration. 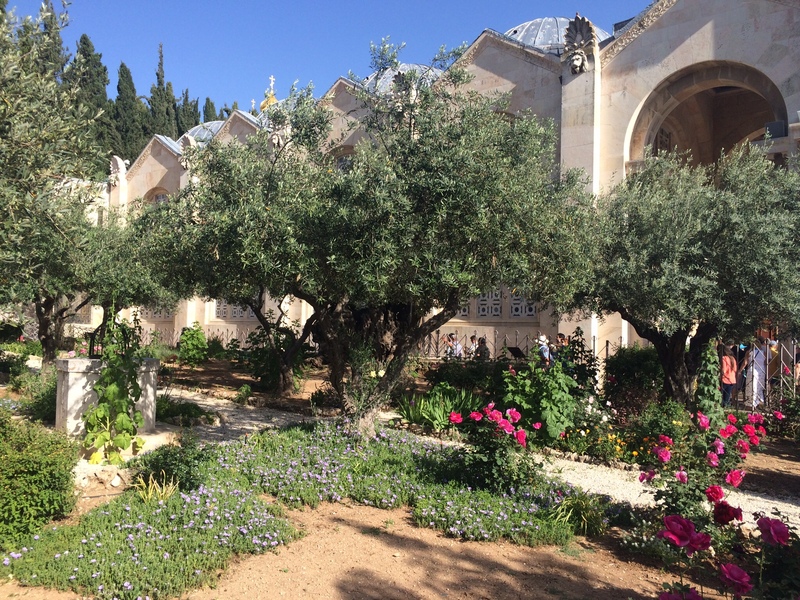 My feelings about being here in Jerusalem changed noticeably throughout that day. I was raised a Catholic; taught by nuns throughout primary and secondary school. In a sense, I spent part of my childhood in the Holy Land (in my head). Later, in adulthood, I came to understand that all the stories I grew up with were situated in modern Israel, a real place. But it wasn't until our flight from Amman was descending over Israel (9 days ago) that I realized how mythological the Holy Land felt to me. Shortly, I would be walking in the same streets where I'd envisioned Jesus walking, when I was a child. It seemed as weird as an imminent arrival at Mordor International Airport or the King's Landing Hyatt. When I got my first good look last Friday at the Dome of the Rock (revered by Muslims as one of the holiest places on earth because the Prophet ascended to heaven there) or the Western (aka Wailing) Wall (revered by Jews because of its proximity to where the second temple once stood), I felt that jolt that accompanies seeing a really famous sight for the first time with one's own eyes. But those ancient olive trees in the Garden of Gethsemene affected me differently; they made the mythological garden in my mind melt away, and they took its place. All this has nothing to do with faith; I suspect that a lot of people, both believers and infidels, might react the same way. It's a progressive experience. A dozen or so mythic Christian sites have now transformed into real ones for me, and there are more to come. I'm starting to feel jaded. And we still haven't been inside the Church of the Holy Sepulchre (where the crucifixion and resurrection are believed to have occurred.) We'll do that tomorrow. In the last three days, we shifted our attention away from the Bible and to the Israeli-Palestinian conflict (first) and some of Israel's most famous natural wonders (second). Those deserve posts of their own. That strip of green in the distance are farms in the Jordan River Valley. The Judean hills looked deceptively peaceful. Our first views of Greater Jerusalem. When I was researching car rentals for Jerusalem, I read that most of the big agencies (Hertz, Eurocar, etc.) don’t want renters to go into the West Bank. This was disappointing. That huge, roughly oval chunk of territory is the focus of so much of the tension that coils around Israel today we wanted to drive through it (plus the path from Nazareth to Jerusalem runs almost due south, down the eastern border). Fortunately, one of my guidebooks extolled an Israeli company, Eldan, that permitted it, and sure enough, when we got our little Fiat (which we soon affectionately dubbed “Pinky”) in Tel Aviv and asked the super-helpful (Israeli) manager which route he recommended between the two cities, he said the best way was to take Highway 90 south along the Jordan River. We asked him if we would have anything to be scared of, should we go that way, and he said not at all; he drove it himself all the time. So when we left Nazareth Thursday afternoon, that’s where we headed. We didn’t leave until almost 2:45 p.m. because we had such an amazing time in Nazareth — so amazing I’ll have to save it to write about on the plane home. But folks said it was a two-hour drive, and we didn’t actually have to return the car until 9 a.m. on Friday, so we felt relaxed, and the road condition — well-surfaced and with only no traffic — did nothing to disturb our jolly mood. The road blocks and walls and barriers that separate the Palestinian Authority territory from that of Israel are infamous, but the one on the 90 south of Beit She’An was trivial — less imposing than a California ag-inspection stop and not even manned (except by an automated camera). 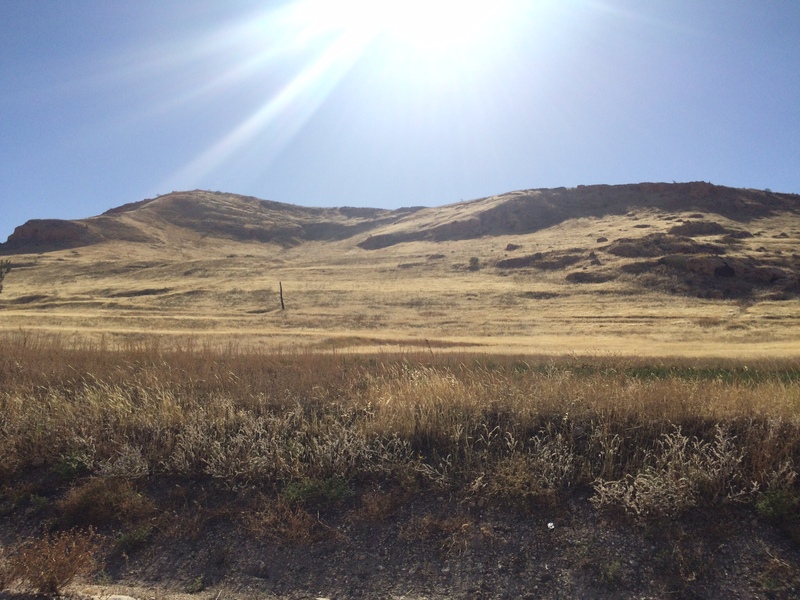 Then we were driving through lovely, almost deserted rolling hills that grew increasingly golden in the late-afternoon sun. We admired the green band of the river valley and made good time, passing turn-offs for Jericho and then the Dead Sea. Soon we were climbing west on Highway 1 through the winding turns that lead to greater Jerusalem, and at the checkpoint leading back into Israeli territory, we sneered at how ridiculously easy it was to cross (compared to the one between San Diego and Tijuana). 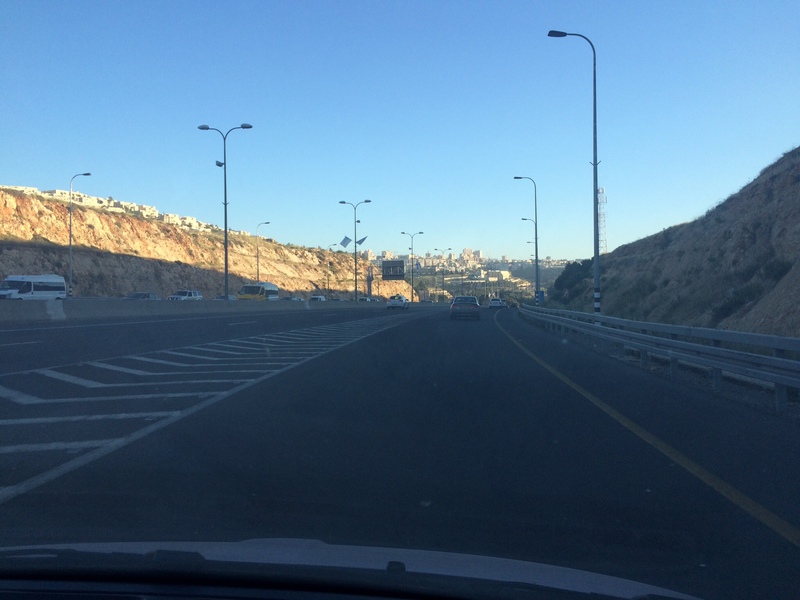 We had hit some traffic leaving Nazareth and in Afula, but we felt certain we would reach our hostel in the city (where we planned to drop off our suitcases before turning the car in) well before dark. Things got ugly when we were getting close to the turn-off onto Highway 60, which looked like it would take us quite close to the hostel. Traffic clotted and we crept and then barely crawled along, but the rush-hour traffic of Jerusalem is notorious, and we figured we were getting a taste of it. Finally we could see the on-ramp up ahead. At the intersection just before it, however, a glowering policeman was forcing everyone to turn away from it. We speculated there must be a terrible accident. I was tracking our progress on Google Maps on my phone, and I figured if we made our way north, we could get on the 60 at the next entrance up. Again the traffic was nightmarish, but after an eternity, we seemed to be approaching a bus station or other transportation complex; the barely moving lanes of cars stretched ahead of us as far as we could see. Then off to our left in the distance we spotted a crush of people. Demonstrators! It was a political demonstration, precisely the sort of thing you’re supposed to avoid in political hotspots. Yet we were stuck! Amused, we watched the driver in front of us urge his car over a curb so he could get on the 60 going north (away from downtown). It seemed a fairly outrageous move. But as we inched forward into where he had been and then sat… and sat… and sat, unmoving, it began to seem more sensible. Ahead in the distance, we could make out more people running toward the demonstration. I yelled at Steve to go over the curb and follow our fellow driver. “This thing won’t make it,” he snarled. “Try it,” I urged, and he did. He was right; the rear wheels didn’t want to climb up over the curb. But when I got out and pushed, Pinky rocked forward, and we were free. The adventure didn’t exactly end there. 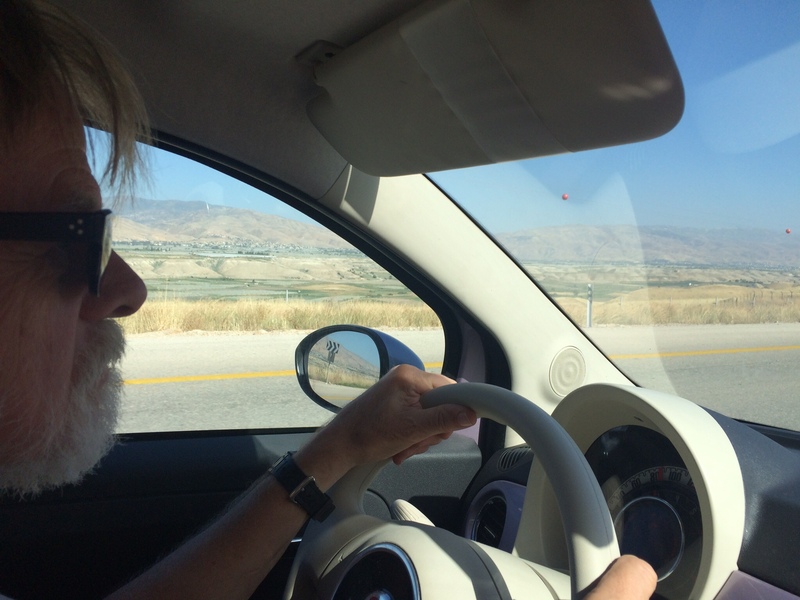 Steve was quite dashing, executing a tricky illegal move to actually get us on the highway, and then I (and Google maps) did some heavy-duty navigation to thread our way to the hotel through the incredible spaghetti-tangle of Jerusalem thoroughfares. We made some wrong moves but finally limped up to the Abraham Hostel around 7. Since then, we’ve had two days (Friday and Saturday) so crammed with mind-boggling sights and information that a) I frequently felt my brain was going to explode and b) I did not have one minute to write. I got up at 5:15 to work on this, but now we have to run to breakfast. After that, we’re spending the day driving to one of the tensest cities in all of Israel, Hebron. This time we’ll be on a bus, with a group and a driver. With luck this time the ride will be unremarkable.